What a difference a year has made for the Los Angeles Rams and the New York Giants. In 2016, the Giants and Rams, both 3-3 at the time they met on the field of Twickenham Stadium in London, battled to a 17-10 Giants win. That win was part of a run that saw the Giants cruise to an 11-5 record and their first playoff berth since 2011 under first-year head coach Ben McAdoo while the Rams limped to a 4-12 record. The Rams have a new coaching staff that is led by Sean McVay, the grandson of John McVay, the one-time Giants head coach from 1976-78, and the one-time assistant coach for Washington, where he worked with the tight ends from 2010-2013 before being promoted to offensive coordinator for the 2014-2016 seasons. 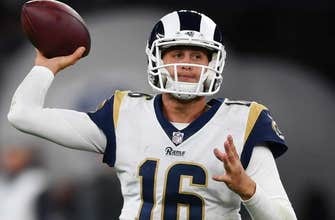 The Rams revamped their offensive line, adding three new starters that includes left tackle Andrew Whitworth; they upgraded their perimeter players by adding receiver Sammy Watkins and tight end Gerald Everett; and they converted their defense from a 4-3 to a 3-4 under new defensive coordinator Wade Phillips. A Rams team that is a half game out of first place in the NFC West, behind the Seattle Seahawks. The Giants, meanwhile have gone in the opposite direction from 2016. They have won just one game out of their first seven. Their offense, which was supposed to be vastly improved from a year ago, is averaging 16 points per game (30th in the NFL) and has been forced to continue the rest of the season without receivers Odell Beckham Jr. and Brandon Marshall. And their top-10 defense, which returned most of the starters from last year, has lost its bite thanks in part to injuries to key starters like defensive end Olivier Vernon, and linebackers Jonathan Casillas and B.J. Goodson. On Sunday, the Rams, who like the Giants are coming off their bye week, will visit the Giants at MetLife Stadium in search of their first win against New York since 2001, a 15-14 triumph in a game played in St. Louis. Despite the Giants’ recent struggles, McVay isn’t exactly licking his chops over what many perceive as a wounded Giants team. One “excellent” player the Giants aren’t going to have Sunday is Janoris Jenkins, their top cover cornerback. Jenkins, who signed with the Giants after starting his career with the Rams, has been suspended by McAdoo for violating team rules. McVay said it’s important that his offense, led by second-year quarterback Jared Goff and featuring receivers Tavon Austin, Robert Woods and Watkins, not become complacent given Jenkins’ absence. That approach is part of the large-scale message McVay has for his players: don’t become complacent because the Giants are in a state of turmoil. “I think the one thing that you appreciate about this league is that every single team on any given week can win and if you’re not ready to go, you get exposed and you get humbled very quickly,” he said. The Giants, meanwhile are hoping to put behind them the ugliness of their first half of the season and turn things around. “I think it’s just a time to understand the circumstances we’re going through, understand what we have, be excited about our opportunities to go out there and compete every week,” said Giants quarterback Eli Manning. If the Giants are to have a chance to stay toe-to-toe with the Rams, it starts on offense. Since losing Beckham and Marshall to season-ending injuries, Manning has targeted his receivers 21 times over two games, with just seven completions for 67 yards and 1 touchdown. He’s hoping that now he’s been able to spend more time working with Roger Lewis, Tavarres King and Travis Rudolph, and with Sterling Shepard on track to return from a sprained ankle that kept him sidelined for two games, the opportunities will be there for the passing offense which has failed to crack 200 yards total in each of its last three games. The Giants’ success is also predicated on their offensive line, which could be without Justin Pugh, their current starting right tackle and best offensive lineman, who has been nursing a back injury. The Rams defense has recorded at least one sack in every game played this season, with all but one game being a multi-sack affair. “(The Rams) are a talented team. They got a good front seven, got a lot of speed. Their corners play well. They do a good job of getting to the quarterback, good job stopping the run. So, we got to be sound up front, know our assignments,” Manning said. Defensively, among the Giants objectives will be to clamp down on Rams running back Todd Gurley, currently fifth in the league with 627 rushing yards. For a Giants defense that has failed to preserve the lead in three games this season, Collins predicted that people are going to see the team that often dominated in 2016.